On 14th October 1939, HMS Royal Oak was sunk by a German Torpedo in Scapa Flow, off the southern coast of Orkney. 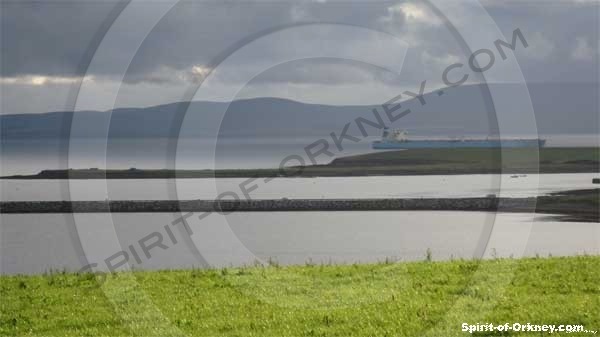 Scapa Flow had been a strategic Naval base since 1905, protecting Britain from German invasion via the eastern island inlets from the North Sea. With an area of about 156 square kilometres, it is a bay sheltered by the mainland to the north, south Ronaldsay and Burray to the east and Flotta to the south. Following an earlier attempt to penetrate Hoxa Sound by a German U Boat in 1914, 21 block ships had been sunk on the Eastern approaches and anti-subamarine nets, boom defences and controlled minefields were added to secure Scapa Flow. During the first few weeks of World War II, nearly 50 British warships were in Scapa Flow including the cruiser HMS Belfast. The western side of the flow near Lyness was their mooring, all except HMS Royal Oak and HMS Pegasus which were moored in Scapa Bay below Gaitnip. On a moonless night, lit only by the Northern Lights, a German U-47 entered at high tide under the cover of darkness, managed to navigate it’s way around the block ships and enter Scapa Flow via Holm Sound. 3,000m from the two ships, her Captain, Gunther Prien launched a devastating tripple torpedo attack on the Royal Navy battleship HMS Royal Oak. One of the torpedos hit the bow causing little damage, in fact it is reported that the crew thought the explosion to be onboard in the paint store. Three more torpedos were fired from the U-47, all reacing their target. Royal Oak took only 15 minutes to sink at her moorings, taking with her 833 members of her nearly 1200 strong crew. 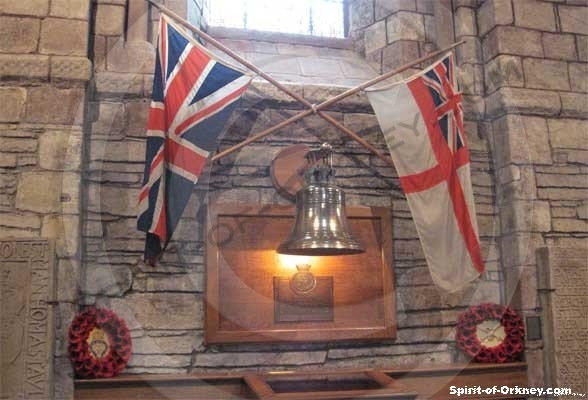 The shipwreck site is now an official wartime grave and a memorial to those lost at sea, resides in St. Magnus Cathedral in Kirkwall. Memorial gardens were created at Scapa Beach. Her resting position is marked by a green buoy and sometimes by small oil slicks as the last vestiges of fuel leaks from her bunkers. An annual ceremony is held by the Admiralty, with divers placing the Ensign over the wreck site. Many of those present are survivors and relatives of the crew. HRH The Princess Royal is expected to lay a wreath on the water during a rememberence ceremony. A parade featuring the Royal British Legion, youth organisations and local dignitaries, will take place on Sunday 18th October 2009 at St. Magnus Cathedral. David Turner, a nephew of Commander Ralph Lennox Woodrow-Clark, who died in the torpedo attack, is publishing a new book about the sinking. Titled “Last Dawn”, it is hoped that the book will help keep alive the memory of those who died. David has also filmed a video for use in the schools, to aid their understanding of the event.